Notes: Rare. The fine and extensive coinage of the Opuntian Lokrians is surprising for a city whose place in history is relatively unknown. 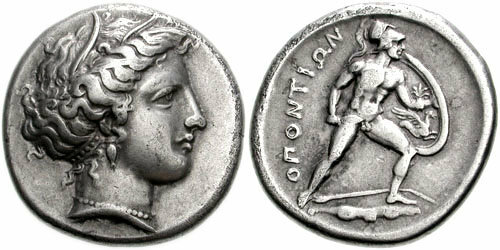 It has been suggested that the Lokrians, returning from service as mercenaries in Sicily, may have brought with them a quantity of Syracusan coins which would have provided bullion and the prototype for the 'Euainetan' head adopted at Lokris.